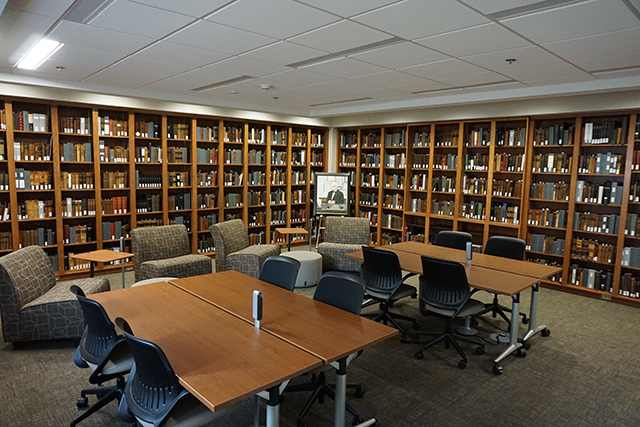 The History of Medicine Room is located on the third floor of the library, room 307. After a generous gift in May of 2015, the room was named for Dr. Leo J. McCarthy. The room is open for study Monday through Friday, 10:00 am to 2:00pm and special hours may be scheduled by emailing medlref@iu.edu. The Ruth Lilly Medical Library History of Medicine Special Collection (HOM), though modest in its approximately 3,500 items, has several books that are of significant historical and commercial value: American Revolutionary War, early American surgery, editions of Renaissance medicine and European science, anatomical and medical plates of quality, colored botanicals, uncommon signatures by leading practitioners and, correspondence related to the unfortunate outcomes of mid-19th century tuberculosis.There are items in this collection considered important assets to scholarship and furthering our understanding of the history of medicine, as printed, practiced, and experienced. Including books early as 1542, the collection contains bindings in a variety of materials and styles, a full range of sizes and quality, printed in Latin, English, German, and French. The opportunities for study and research are diverse; the material is well suited for deeper mapping, can act as an enhancement to the scientific element of medical practice. To handle a first edition of America’s first systematic text on surgery or, to examine the highest quality reproductions of Vesalius prints no longer available increases one’s appreciation, can be said to induce shivers of awe and inspiration. In an ever-increasing age of technological development, steeping oneself in an object from a previous century, signed by an important figure, can be a touchstone to our cultural heritage. Some of the more interesting and finer objects can be found in the abbreviated catalog of the collection.